Harinjaka Ratozamanana (Part 1) : is he a GENUINE face of Madagascar? 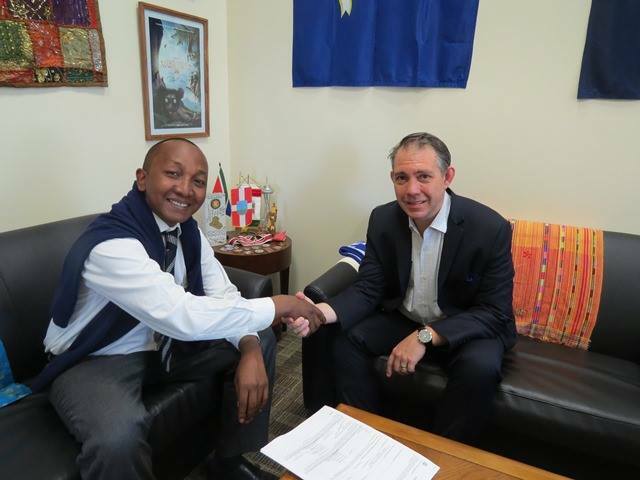 This man in question was congratulated for his “work in promoting entrepreneurship and innovation among Malagasy youth” and he was therefore invited to Global Entrepreneurship Summit and to a prestigious reception in the presence of President Obama during his visit to Nairobi to represent MADAGASCAR. Harinjaka RATOZAMANANA is not an entrepreneur, not a CEO of anything other than the supposed boss of exploited hardworking intelligent Malagasy. He is not a social Blogger – He is a master of lies and deception – He continues such a practice and broke the community of thoughtful and passionate bloggers by stealing the spotlight to gain some legitimacy. Then started his personal campaign misusing the media to show that he is working for, on something, when in fact he is building an empty career of dishonesty. There is tremendous anger felt by Mr. Ratozamanana’s exploited associates as he parades around “raising” funds, presenting projects created by skilled individuals. Individuals who unlike him did not have time to publish on facebook photos of themselves shaking hands with high officials, celebrities, popular and rich kids but instead worked hard to create and innovate. Mr. Ratozamanana continues to this day to collect the trophies they deserve. Stamping his name of other people’s success. He is quick to call journalists so as to strengthen his deceitful legitimacy using the media. He has no shame in repeatedly lying and declaring himself to be the brains behind any new concepts. The name: “Harinjaka Ratozamanana” has treacherously become a reference in social blogging, environmental causes, new technology initiatives and now entrepreneurship. One can only wonder what trendy field Mr. Ratozamanana will associate himself with next? What has he really achieved over the years? Who has he really helped? We kid you not, you will not find a single soul that has felt empowered by this man. The majority will tell you tales of betrayal. All the Malagasy community receives from him are updates on the latest trend he wants to be affiliated with but are devoid of any substance. Mr. Ratozamanana is the epitome of the modern day slacker and social media manipulator. Indeed, if there is a whiff of fame and money in anything, this man would sell himself and steal the opportunity like a hungry bear waking after hibernating. Mr. Ratozamanana is a man obsessed with fame. His moral compass is guided by money. He does not undertake these popular projects to contribute to Madagascar’s development or in bigger picture Wordly change, he undertakes them to paint a picture of success without the competence, the talent or anything but exploiting others. Mr. Ratozamanana has collects along with trophies he does not deserve, contacts of the highest level to use for his next conference tickets and funds. To illustrate this, Mr. RATOZAMANANA even made it to the list of “One of the 100 young African leaders of tomorrow.” (100 jeunes leader Africain de demain). But what has he really led? Other than instagram, facebook, twitter and calling out journalists who are desperate enough to beef up his profile and reputation in written press, radio and TV. This man parades around in national and international conferences falsely representing Malagasy citizens. Showing famous logos, participant badges and event programs on social media as if these define intelligence and hardwork. Mr. Ratozamanana does not attend these conferences on the basis of his merits or the fruit of his hard work but receives his pass through deceitful networking and opportunistic practice. Unfortunately, governmental institutions, CEOs and others with opportunities to offer continue to fall for Harinjaka Ratozamanana’s lies. Thus lessening the credibility of these institutions in wanting to promote MADAGASCAR. Pakysse, the blog, always stands for JUSTICE. Harsh our words may be, but we ALWAYS speak TRUTH and we NEVER stay QUIET in the face of INJUSTICE. Opportunities no matter the importance, that would elevate Madagascar nationally or internationally should be awarded to those who truly deserve them. Even if we are heard and understood by one person only about the real character of Mr.Ratozamanana. We have brought change to MADAGASCAR. Michaella Andrianasolo, who was selected by the Global Young Leader’s Council based on her academic merits and social endeavor at 15 years old to attend the first inauguration of President Obama in Washington DC, she now continues to work in international justice and has launched a Malagasy based clothing brand. RANDRIANAIVO Arson Ambinintsoa, CEO and owner of the well known GASTRO Pizza: a man who managed to create the first ever national chain for pizzas, seems simple but Chef Mbinina represents the hard working Malagasy pride. These are only the few silent ones who focus on hardwork, constant innovation and actively contribute to Madagascar’s present and future. 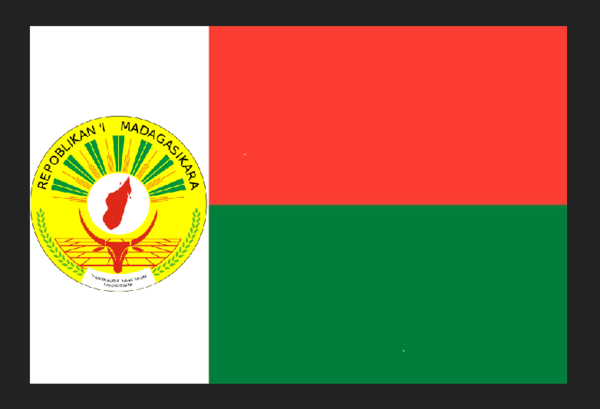 The likes of these individuals represent the past, present and future Malagasy. They are the true leaders of tomorrow, the genuine faces of MADAGASCAR. Pakysse, the blog, stands for EXPOSING masters of deceptions such as Harinjaka Ratozamanana. The question remains: would you let a mindless, opportunistic, unemployed man represent you as the new Malagasy generation? Since he has already landed in Kenya, this time he was quick to run away and bathe in the bitter taste of his dishonesty but for the future BEWARE ! The only skill Harinjaka RATOZAMANANA has is that of DECEPTION. In the wake of the 26th of June which marks the day Madagascar gained independence from France in 1960, one cannot help but reminisce. Singing the anthem, raising the flag, lightening up lanterns and watching fireworks, these are the traditions to celebrate independence. A number of historical dates led to this momentous day. One of these memorable dates was the Malagasy uprising of 29 March 1947 when Malagasy nationalist known as the “Mouvement Democratique de la Renovation Malgache”, MDRM formed in 1946 with the ultimate objective of independence. The MDRM revolt against the French rule resulted in an estimate of 60 000 to 80 000 casualties, many say these numbers are an under-estimation and still today, stories of humiliating and barbaric killings of innocent Malagasy civilians remain a sensitive topic of conversation. Even so, Malagasy are aware that they suffered in the fight for the right to self-determination. In essence, the right to self-determination is the right of a people to determine its own destiny. According to this principle the people is empowered to choose its own political status and to determine its own form of economic, cultural and social development. Quoting, Wolfgang Danspeckgruber, a prominent author and practitioner in the field of international relations : « No other concept is as powerful, visceral, emotional, unruly, as steep in creating aspirations and hopes as self-determination. » All peoples have the right to self-determination. This powerful concept was particularly significant for colonized nations, such as Madagascar around 1960s. This right to self-determination has been recognized in international law as a right of process belonging to peoples and not to states or governments. Self-determination is not mere abstract theory as it is embodied in Article I of the Charter of the United Nations, in the International Covenant on Civil and Political Rights and the International Covenant on Economic, Social and Cultural Rights, the Declaration of Principles of International Law Concerning Friendly Relations and Co-operation Among States, the Helsinki Final Act, the African Charter of Human and Peoples’ Rights and affirmed by the International Court of Justice in the Namibia case, the Western Sahara case, and the East Timor case. These demonstrate the universal recognition of the principle of self-determination as an integral part of human rights law which has a universal application. In early 1960s, history books talk of a “spirit of political reconciliation” in Madagascar. Independence became a reality and Tsiranana, the first Malagasy President began a regime which maintained strong economic ties with France. A tie we never seem to let loose of as various Presidents succeeded Tsiranana. 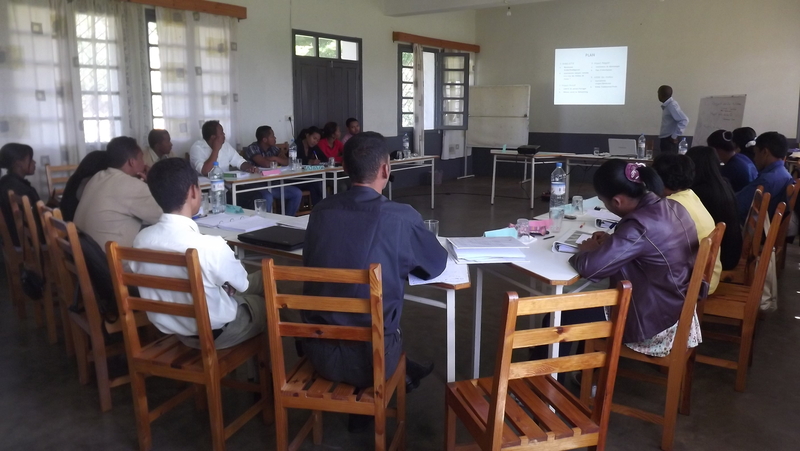 The principle of self-determination provides for the Malagasy people to choose its political status and to determine its form of economic, cultural and social development. Theoretically, the core of the principle lies in the right of choice. In practice, however, the outcome of self-determination will affect the attitude of governments towards the actual claim. Indeed, fragile and weakened African nations, like Madagascar opted to maintain strong ties with the West post-colonial rule. This was not all too detrimental and may even have been necessary. Sadly, occasions and deals where nations like Madagascar benefited are rare, if they do, the Malagasy rarely see how these deals have improved their living conditions. Madagascar is scared with a no-win economic relationship with the West gravely threatening its natural resources thus its economic, political and social status. Free spirited artist Imany sings the painful truth when she declares “Africa has the shape of a broken heart and the heart of a broken land”. She continues by painting an all too often African reality singing : “a land that fell from heaven straight to hell.” This is a perfect illustration of a continent blessed and cursed with its own riches. Take, the Democratic Republic of Congo for instance, it also gained independence from Belgium in 1960. Yet, at this very moment, fathers, mothers and children risk their lives in a land victim of continuous and ongoing conflict which already cost the lives of approximately 3 to 6 million lives. When it comes to the enormous wealth in natural resources on the African continent, Madagascar is not lacking. Madagascar, shaped like an angel’s footprint has similarly been blessed and cursed with an abundance of mismanaged, exploited and plundered natural resources. Left to the common fate of African nations as one of the poorest countries in the World. Globalisation allows us to travel, to enjoy a wider variety of educational resources, the use of Internet and other technologies and awareness of pressing issues such as fight against HIV – AIDS. However, it also has some detrimental consequences that have significantly impacted the developing world. ‘Neocolonialism’ or ‘new-colonialism’ describes the re-colonisation of Africa through corporate financial arrangements backed up by Western countries, or perhaps dare it be said – coercions and bribes are extracting the wealth from the continent as opposed to guns during the era of colonialisation. Although the wealth of natural resources has the potential to help eradicate poverty, it does not take long to understand that this opportunity, impacted by globalisation, failed to materialize. Instead Madagascar, like the continent is degenerating. At the same time, it is recognized that compliance with the right of self-determination is a fundamental condition for the enjoyment of other human rights and fundamental freedoms, be they civil, political, economic, social or cultural. Let us simply bear in mind some of the reality we live in and when the occasion presents itself to act upon it so as to better our lives we should not hesitate. Be it upon negotiating a “just” deal with another corporation or “refusing bribes” for the exploitation of our natural resources. As globalisation infiltrates further in our way of life, Madagascar and Malagasy must make more effort to keep up with the changes. In spite of the fact that we may be politically independent and questionably so economically, the 26th of June remains and should remain a day of celebration. Malagasy lives were lost in the past to affirm our self-determination and we should celebrate to honor those who fought for our independence. INJUSTICE AND POVERTY: Andry Rajoelina must stop taking us for fools. He must apologize and resign! Egypt, Tunisia and Spain, Senegal and finally Russia, those are countries where the social commitments of my friend bloggers were fruitful. If they could reach their goals, it is also high time for us to be responsible and take the population’s side till we get results. Indeed, the reason to revolt against political mistakes is an absolute rights to each individual. Theoretically, in a country where Rule of law matters, the main characteristics of a democratic regime is focused on the respect of hierarchy and norms as well as equality in terms of individual’s rights and an independent justice. Which of these elements are respected in Madagascar? None, in my opinion, the first person in charge who has stepped back from this institution is the specialist of the incantation “chief of the Judiciary of the non-democratic republic, the event guru and the professional in the field of animation of the high authority of transition” Andry Rajoelina, who is also a man with irresponsible character, immature and careless, and incapable of managing the situation prevailing in the country. I will not tergiversate since nowadays, it is very difficult for us to go to the street and organize a popular movement due to the paranoia of some officers within the public administration who support this incompetent regime. Thus, for the moment I am launching a call targeted to this man who is ruling the High Authority of Transition that he publicly apologizes among my fellow citizens like the way the former President did and resign at the same time. For the pure and simple reason that he has led this country and the whole population in a never lasting tunnel due to his greed of power. No tears will be shed regarding the resignation of Andry rajoelina who gave such bad examples by taking direction away from all good senses and logics of a modest President.